This photo was taken in the Summer of 1960 at Ike and Kathleen's home at the American Legion Country Club in Mount Union. Brandon (Ike) Cunningham took the picture. 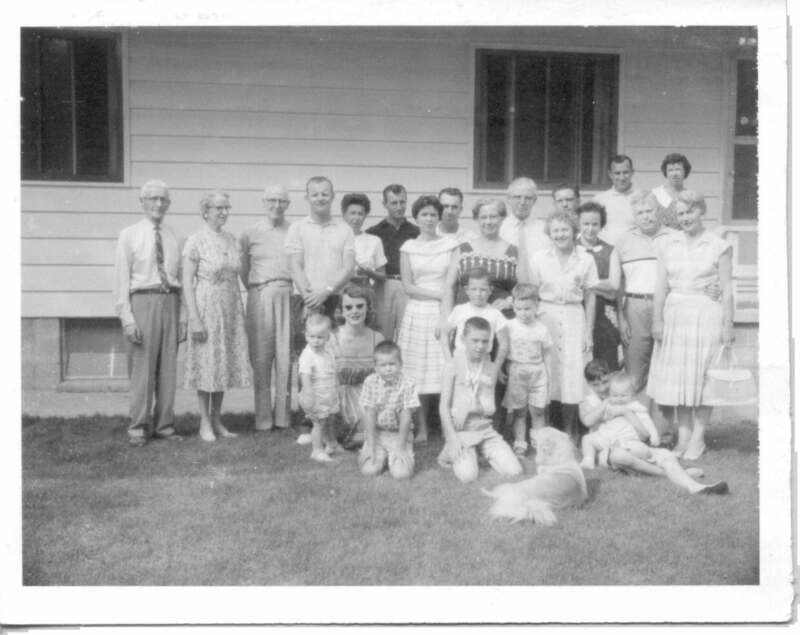 Standing on steps in extreme back right: Blase Cindric, Phyllis Cindric. Standing at ground level (l. to r.): William Harley, Ruth Harley, Arthur Cunningham, ????? ?, Joann Remek, John Remek, Kay Rosenberry, Bill Rosenberry, Kathleen Cunningham, Merrill Cunningham, Verna Cunningham, Ray Greenisen, Bernice Greenisen, Ernest Cunningham, Evelyn Cunningham. Kneeling/sitting (l. to r.): ?? ?, Norma (Cunningham) ?? ?, ?? ?, Bill Rosenberry (w/ arm in sling), Ernest Greenisen, Billy Greenisen, Taffy (the Cindric's dog), Kay Rosenberry (now Kay Coffman) holding Robert Greenisen.